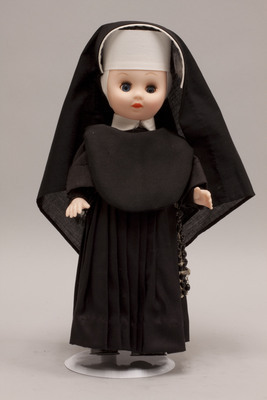 "Doll wearing habit worn by Daughters of the Cross"
Plastic doll is wearing a habit worn by the Daughters of the Cross. Marie l'Huillier de Villenueve founded one of the first uncloistered orders for women in Paris in 1640. The doll is wearing a black dress, black guimpe, white wimple, and black veil. A black rosary hangs from her waist.